Thanksgiving is over. Family and friends have all gone home and your beautiful golden bird has been reduced to a few slices of meat and a pile of bones. You start cleaning up and get ready to throw the bones away. Wait! Don’t do it! Did you know that pile of bones has something left to give? “I knew that!” you say. “Turkey broth”, you say. And you are absolutely right! 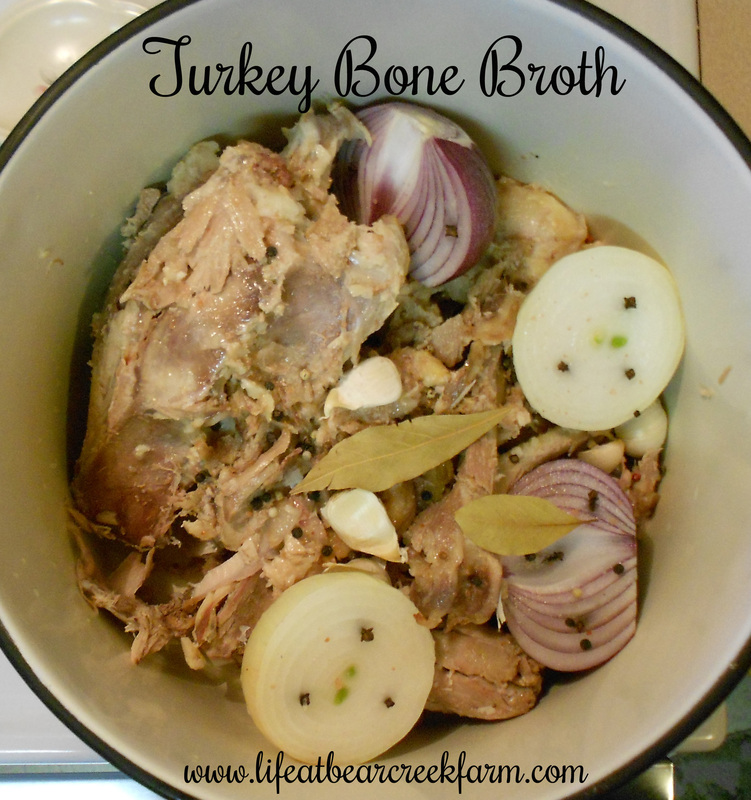 Turkey broth is yummy and makes great soup. But what if we went one step further? 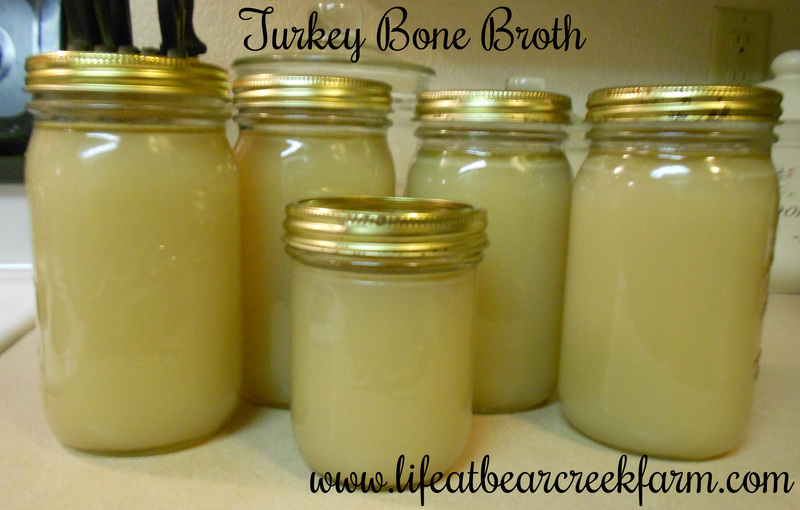 What if we make bone broth? I’m so glad you asked! 🙂 Bone broth is what happens when you let your broth simmer away until all the minerals from the bones transfer into the liquid. You’ll know when that happens because the bones will start to crumble. Not only does the broth taste good, but now it contains the minerals that our bodies need to build strong bones and remineralize our teeth. So let’s go! At my house I always make sure that I get a turkey way bigger than I need to feed everyone at dinner. That’s because we love turkey and I get lots of leftovers. I slice what ever is left of the breast for sandwiches and dice up the rest for soup and turnovers. Now comes the bone broth part. 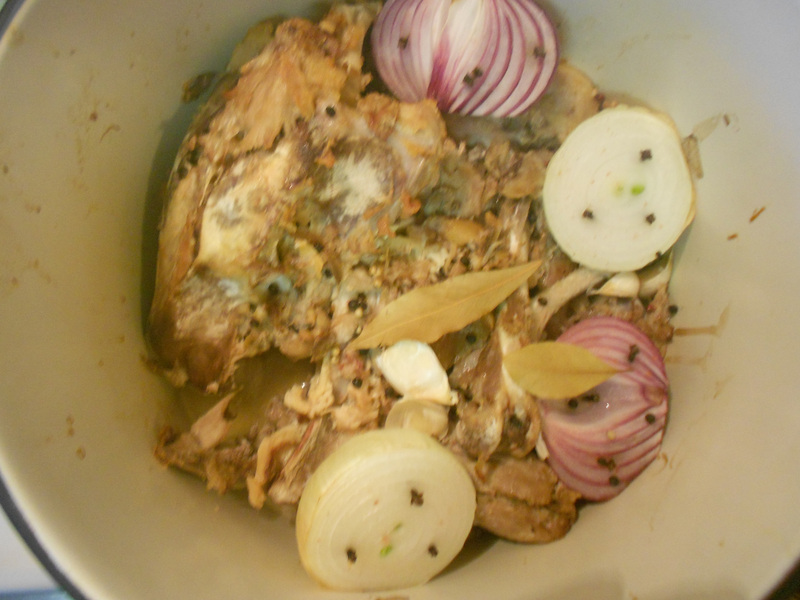 The carcass and all the random bits of meat and skin get tossed into my big stock pot. I cut a few onions in half a stud then with cloves and toss them in. I throw in a head of garlic and any left over carrots and celery from the veggie tray (sadly, there weren’t any left this year), and add a couple of bay leaves. Throw in some sea salt and about a dozen peppercorns. Then I put in enough water to just cover the bottom of the pot and stick it in a 400 degree oven for 30 minutes. Roasting the bones and veggies gives the stock a deeper flavor. After the 30 minutes of roasting, I add water to cover the bones and put it on the stovetop. When it comes to a boil, turn the heat down and let it simmer. The longer it simmers, the better it is for you. I like to put it on in the morning and let it go for 12 hours or so. Or, you can put it in a large crockpot and let it go overnight. You will probably need to add some water from time to time to keep the bones covered. After it’s done, remove the bones and veggies and strain the broth. When it cools a little, I ladle it into canning jars.